Obama's Absence At Asia Summit Seen Hurting U.S. Trade Many U.S. companies were hoping President Obama would be able to push for more open trade in Asia. But because of the U.S. government shutdown, he was a no show at the Asia-Pacific summit in Indonesia. The budget crisis in Washington is distracting from other trade initiatives as well, analysts say. Indonesian President Susilo Bambang Yudhoyono speaks Tuesday at the Asia-Pacific Economic Cooperation summit on the Indonesian resort island of Bali. President Obama missed the meeting due to the budget impasse in Washington. At one seat, China's President Xi Jinping studies his cards. At another, Russian President Vladimir Putin is stroking his chin. Asian leaders fill the other seats, each trying to win the pot, which is filled — not with poker chips — but with jobs. That's the kind of high-stakes game that played out this week in Indonesia, where global leaders got together to discuss trade relations. Their gathering ended Tuesday, and exactly who won what is not yet clear. But this much is known: President Obama was not at the table. And his absence, due to budget and debt tensions in Washington, was not good for American workers. Or at least that's the assessment of the president himself, as well as many economists. Economists say the president needs to be in the game, but he missed his chances at the three-day Asia-Pacific Economic Cooperation summit. "It's always important to show up" whenever global leaders are talking trade, said Bill Adams, senior international economist for PNC Financial Services Group. "Sweeping trade agreements are never settled at one meeting, but they are large and complex, so you need to keep working on them," he said. "You need face time with other leaders." At a news conference Tuesday afternoon, Obama concurred. "I should have been there," Obama said. "It's like me not showing up at my own party." Many Asian leaders had hoped to end the APEC meeting with an announcement about advances in trade deals, in particular the Trans-Pacific Partnership with the United States. But those hopes fizzled, with some Asian officials saying they fear the TPP lost momentum because Obama was not there to push it. Obama agreed, telling reporters, "I would characterize it as missed opportunities." 3.) favorable trade deals (U.S. companies getting access to new markets). Options No. 1 and 2 are off the table, given that Congress is in no mood to spend more money, and the Fed already has pushed interest rates to historic lows. So the only booster shot would have to come from U.S. exports. That's why Obama wants the TPP. His goal is to get 11 other countries in the Asia-Pacific region to make it much easier for U.S. companies to sell services in Asia without having to set up a physical presence there. So companies engaged in, say, digital media, online retailing and health sciences, are excited about getting a better shot at Asian customers without having to open expensive foreign offices. The White House first announced outlines of the agreement back in 2011 when the APEC summit was held in Obama's old hometown, Honolulu. Speaking on the sidelines of that APEC gathering, Obama said that a trans-Pacific partnership would "boost our economies, lowering barriers to trade and investment, increasing exports and creating more jobs for our people, which is my No. 1 priority." But getting the trade representatives for the United States — along with other TPP partners Australia, Brunei, Canada, Chile, Japan, Malaysia, Mexico, New Zealand, Peru, Singapore and Vietnam — all on the same page isn't easy. Schmoozing with Asian leaders might have been helpful this week. In fact, Obama had been scheduled to be the star speaker at APEC on Monday. And at the leaders' retreat Tuesday, the theme was "America's leadership and priorities: What they mean for the world." But as it turned out, the president had to skip the gathering, allowing the heads of China and Russia to have center stage as they met with leaders from other countries that rim the Pacific Ocean. 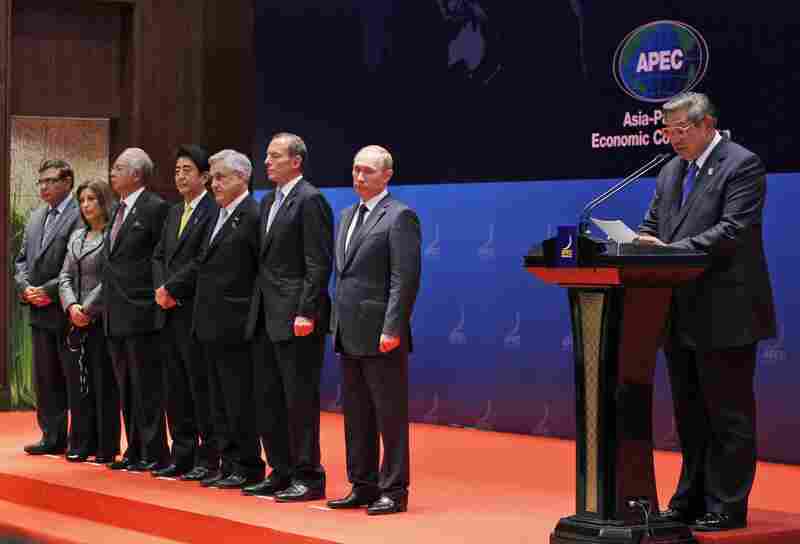 Collectively, APEC countries include about 3 billion people and generate half of the world's economic output. Obama said he needed to stay in Washington during the intense political battles over the budget and debt ceiling. The APEC summit had offered Obama an opportunity to demonstrate his often mentioned "pivot to Asia." The president wants the United States to be deeply engaged in Asia to serve as an economic and military counterweight to China. But the constant swirl of domestic politics has made it tough for him to connect with Asia's leaders. In 2010, he canceled two trips to the region — once to stay in Washington to push Congress on health care legislation, and again because of an oil spill in the Gulf of Mexico. And this year, he had to skip APEC because of politics. The White House had hoped the APEC gathering would end with a splashy announcement of a TPP agreement. Instead, it ended with a statement that countries are "on track to complete" the talks, with the goal of reaching an agreement this year. "It's a loss" for U.S. businesses to have their president sitting out an event that could have advanced trade, said Jerry Jasinowski, an economist and former president of the National Association of Manufacturers. Not everyone shares that assessment. Labor groups and others opposed to TPP were glad to see Asia leaders avoid mention of the trade deal. "That the leaders have admitted that there is no deal nor a clear path to obtaining one this year, despite the hype built up pre-summit, reveals the growing domestic political blowback against the TPP," Lori Wallach, director of Public Citizen's Global Trade Watch, said in a statement. Public Citizen and others groups are concerned about TPP's potential impact on labor standards, capital controls and the environment, among other issues. Jasinowski said that at least on the jobs question, "U.S. manufacturers feel they already have lost the jobs they were going to lose" to cheaper competitors in Asia. "The low-wage exodus is over, so now manufacturers are looking for more exports" of high-end U.S. products and services to overseas customers, he said. But Jasinowski said the biggest loss for trade supporters was not Obama's decision to stay home. It was the reason for his decision, namely, the inability of Congress and the White House to work together. And the federal shutdown also has led to the scuttling of the second round of trade talks that were due to start in Belgium with European countries. Getting any trade deals approved by Congress would be challenging during the best of times because many labor groups and some business interests are wary of them, Jasinowski said. With relations between the White House and lawmakers now so ragged, the outlook for building pro-trade coalitions may be diminished, he said. "Having the president not go to Asia won't stop global trade," Jasinowski said. "But the increased animosity [in Washington] will make it harder" to get lawmakers to work together on trade-related legislation.